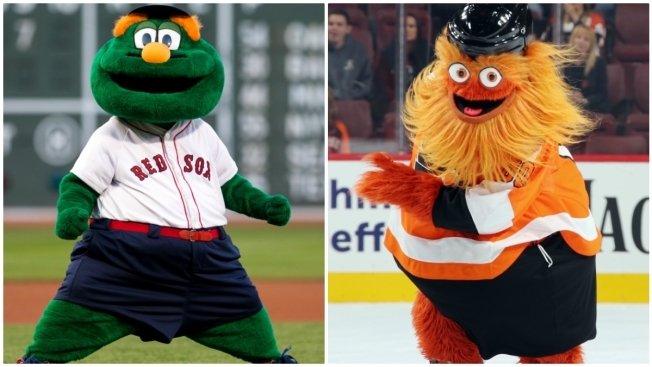 Last week, the Philadelphia Flyers revealed their terrifying new mascot Gritty, who is already making headlines, not only for his scary looks, but for bashing beloved Red Sox treasure -- Wally the Green Monster. The two mascots exchanged words on Twitter Thursday after Wally posted a tweet suggesting the creepy orange muppet was a less attractive version of Red Sox pitcher Craig Kimbrel, who is known for his ginger beard. The tweet read, "Tinder pic vs real life." Gritty quipped back, "I always assumed you were a Craigslist missed connections kind of guy," to Wally’s account. Fans on the social media platform were living for the hilarious exchange between the cuddly Green Monster and the googly-eyed orange beast from Philly.